Walk straight onto the sand from your own garden. Beach front AND lagoon front; overlooking Whiritoa surf beach, a safe swimming lagoon for children and beautiful New Zealand native bush. Expansive deck sea views, sheltered from the wind because of the unique location partway up the lagoon. Views can also be seen from two bedrooms, lounge and dining room. If you want relaxation, peace and quiet, this is it; no traffic and moonlight nights. 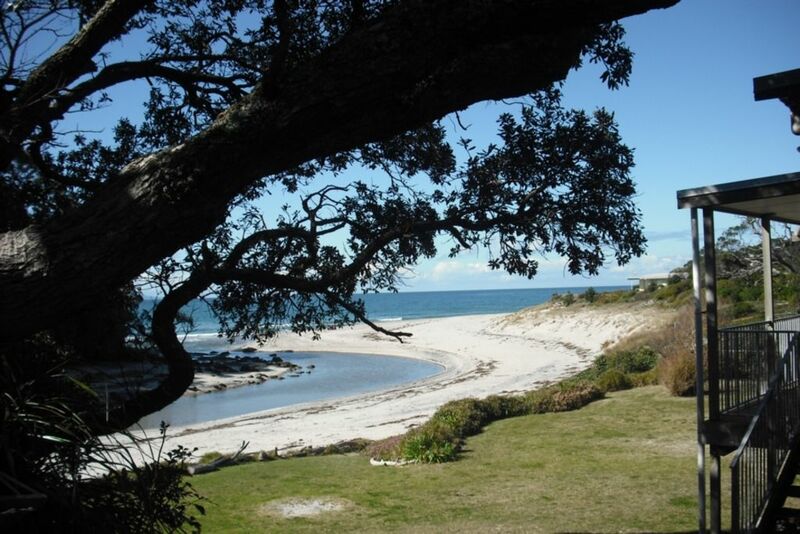 Enjoy the native birds in the magnificent Pohutukawa tree on your section, go for a surf or fish at Whiritoa beach, kayak in the lagoon or take a walk through the bush to the next bay and see the farmland and spectacular views over the Pacific Ocean on your way. Watch carefully, you may see a school of dolphins. When you reach the next bay, have a picnic, swim, fish or explore the rock pools. Relax and enjoy this 1970s holiday home, with the sound of the waves always in the background. Internal garage which is lined and has curtains. Parking for two cars (or car and a boat). For large groups; our next door neighbours' property is also available on Bookabach. Whiritoa hosts one general store. Restaurants, shops, supermarket and cafes are only ten minutes away in either direction; Whangamata, 12K to the North and Waihi, 15K to the south. NOTE: Under Kiwi bach tradition you are expected to: Clean the house and do the dishes before you leave; Bring your own linen (towels/sheets/tea towels); Blankets provided. We can arrange cleaner upon request for an addtional fee. No teenagers unless accompanied by adults. We are a mature New Zealand couple who were lucky enough to buy this exceptional beachside property. We take great pride in ensuring the property and gardens are clean and well maintained so that it is in the best possible condition to for others to come and relax and enjoy their holiday. This house has a hidden secret. It is perched on a rise behind a stand pohutukawa trees, so you would never know, when looking up at it from the beach, the amazing views it has. Huge deck with expansive views of the lagoon, beach and native bush, plus unique location partway up lagoon provides shelter from the wind when sitting on your deck. The house was built in the 1970s and retains much of the decor from that era, yet it is very comfortable. Comments from guests have been, "you could live here". Gas heater and electric fan wall heater. One car internal access garage, plus one car parking outside on site. 1970s style furnishing. Large L-shaped couch. Beautifully landscaped gardens with expansive lawns. We were a stones throw from the beach, and views all day long. The location is stunning. The Bach is comfortable and clean. Would definitely stay again. Great property and the location is spot on with walking down to beach and lagoon etc. We enjoyed every moment - just too short! Our next visit will be longer. Perfect location. If you are looking for a peaceful break away from the "rat race" - this is the place for you! We went for long walks; enjoyed family time on the deck watching sunrise and sunset. The setting was beautiful and very relaxing. I would not stay there again because it had no WiFi which we found really limiting. It was only really suitable for people living in NZ as you had to provide your own towels and sheets. Not user friendly if you were coming from the UK and had to have towels as part of your luggage. The house was tired and needed some TLC - the shower only worked if you tied it up with a piece of string. The leaving arrangements required you to do things like sweep out the garage, we sort of felt that was the responsibility of the owners rather than the customers. Susan was very efficient and the admin went very smoothly. We agree our property is not 5 star on the inside, but it IS 5 star on the outside and we pride ourselves on keeping it clean and well maintained. We also agree that it is not suited to overseas guests because linen is not supplied. However, this is clearly stated on the website and I always remind overseas guests of this when they first book in case they want to cancel with refund.